Our communication styles continue to change over the years. When only analogue communication was available, each phone line was assigned a specific telephone number. If the user moved and wanted to keep the same number, it was necessary to reroute the phone line. When IP started to gain popularity, it became possible to assign a telephone number to a specific device. Simply by moving the device, users could use the same number in different locations. Now, users expect that telephone numbers can be assigned to specific users, which can then be used from any device. creating an opportunity to revolutionize their work style. The Panasonic KX-NSX series delivers the next generation of communication systems to meet today's work style. The KX-NSX2000/1000 supports the following number of trunks. The following shows the number of each terminal equipment type supported by the KX-NSX2000 / KX-NSX1000. *2 When Digital XDP is used, the maximum number depends on the gateway system. 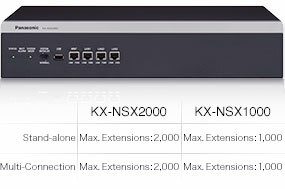 *3 The KX-NT300 series is not supported by the KX-NSX2000/KX-NSX1000. It is only supported by expansion gateways in a multi connection system. *4 Communication IP cameras and IP video doorphones are not counted in the number of users. *1 Requires Normal User AK, Mobile User AK and Advanced User AK. *2 Requires Normal User AK and Mobile User AK. *3 Requires Normal User AK. *5 If assigned as a main device, sub device and wireless device is unavailable.